Occurring alongside Art Basel, Design Miami/ presents 34 galleries from around the globe and has become the premier venue for collecting, exhibiting and discussing design. HOSTLER BURROWS features my new wall installation CONVERGENCE I/18 alongside Kristina Riska, Pekka Paikkari, Eva Zethraeus and many other exquisite designers. The SALON hosts the finest collections of historical, modern and contemporary art and design by 56 galleries from 11 countries. This year Hostler Burrows features my Circle II/2017, new work by Finnish ceramic artists Kristina Riska and Pekka Paikkari, and Pebble Tables by Gal Gaon alongside many of their exquisite designers. In its fifth edition, the FOG art fair takes place at the Fort Mason Center, with 45 internationally renowned galleries presenting their latest in art and design. HOSTLER BURROWS is featuring my latest installation Deconstructed Column I/2018 specially created for this show, alongside many other of their exquisite designers. The SALON hosts the finest collections of historical, modern and contemporary art and design by 56 galleries from 11 countries. 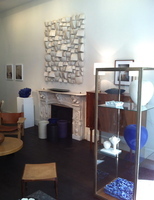 This year Hostler Burrows features Wall Pillows Blue Rectangle alongside exquisite work by Atelier Biagetti, Gal Gaon and Kristina Riska amongst other designers. 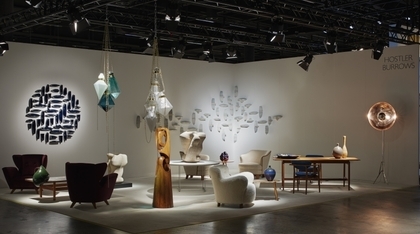 Occurring alongside Art Basel, Design Miami/ is a premier venue for collectible design. HOSTLER BURROWS is presenting their latest in Nordic design and my recent installations WALL PILLOWS BLUE CIRCLE II/17 and CORNER MURMURATION I/17 conceived and created for this showing. A one-night spring event where East Tenth Street galleries & dealers open their doors to present their latest acquisitions of contemporary design and antiques. Besides current works by their staple artists HOSTLER BURROWS is featuring - JULIO ESPANADA: TOTEM - a special exibition of digital drawings based on the artist's seven year meditation practice. Originating in Maastricht, the Netherlands, this is the first time TEFAF New York Spring comes to the Park Avenue Armory and presents the latest of modern and contemporary art and design. HOSTLER BURROWS (Booth #83) features Blue Oval I/2017 alongside many of their exquisite designers. Marking its 63rd year, this prestigious fair showcases 70 galleries presenting art, antiques and design from Antiquity through the present. 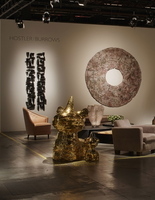 HOSTLER BURROWS (Booth 26) features Shadow Wall Pillow Horizon (Black&White) alongside exquisite mid-century treasures and contemporary designers.